I jumped right in, didn't bother much with refining picturetaking and stuff. This table I use to keep track of my scoring. 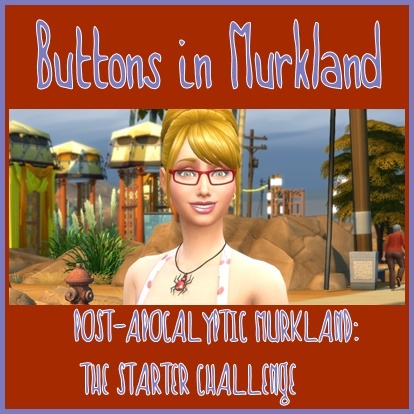 I can't wait to see how the challenge works with sims 4. So far everything works fine. 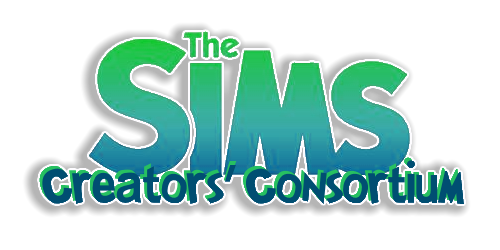 Tell you the truth, I never managed to finish a legacy(neither Sim2 nor Sim3), mainly due to technical problems with the game, the saves and clitches. 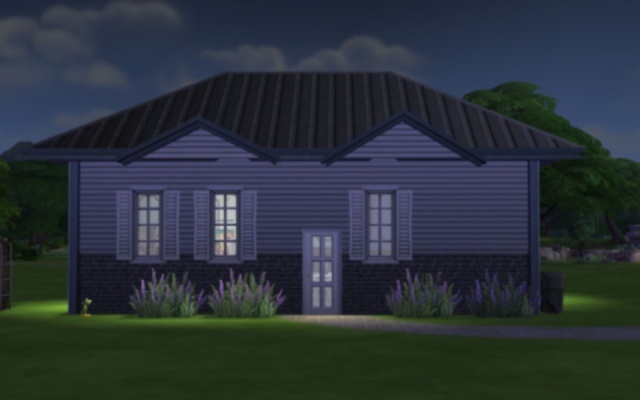 I started my legacy in Willow Creek on the Oakenstead lot 50x50. 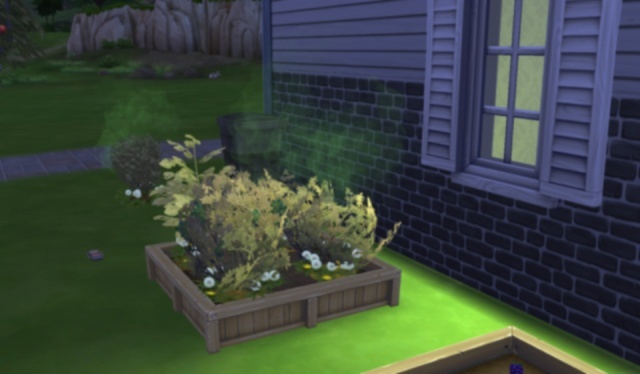 Bulldozed it when moving my Sim in. 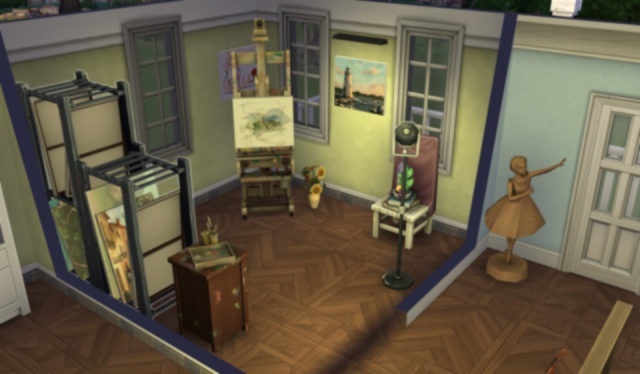 Started out with just a bed and an easel. 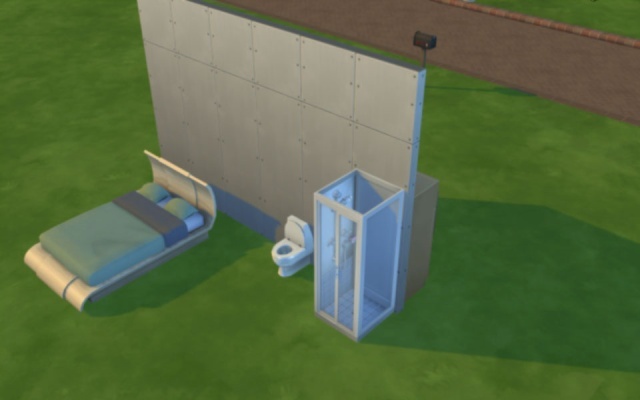 Here a picture from later when I added some bathroom facilities and a fridge (on the other side of the wall). Zeus took on the painter career. I found out there is an easle in the museum to practice painting, but it is almost always occupied, so I went for the cheapest easle from the buy mode. 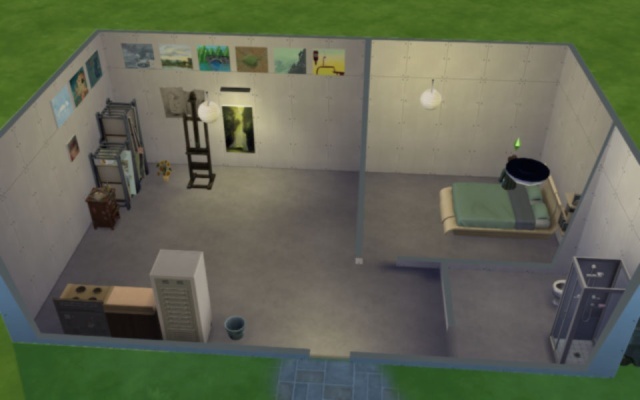 The bed I chose the most expensive I could afford. 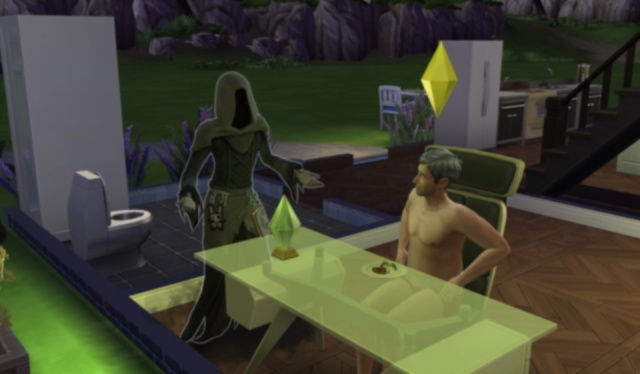 The first two weeks my Sim went to public bathrooms, took showers in the gym and ate at the bar (order chips - they are for free, but not always avaliable). At daytime the park is a good place to look for free food on the tables (leftovers from somebody's bbq) It often is of excellent quality. To cook from the fridge costs money, but quick meals like cereal are for free. They don't quench all hunger, but it's a good way to save money when tight. Zeus became good friends with Zoe Patel. 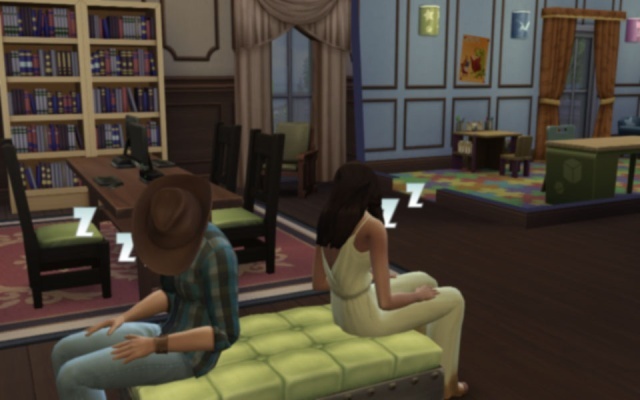 He tried to romance her several times, but she just thought it was awkward. 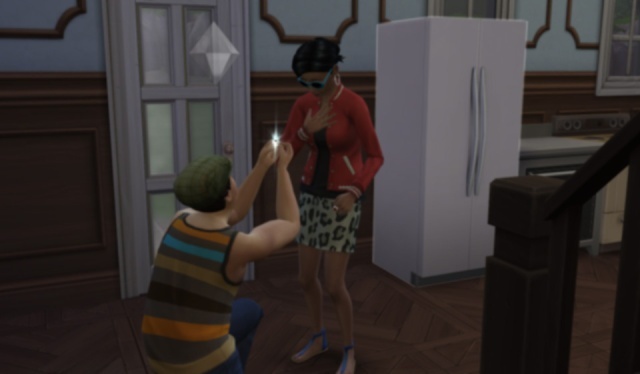 My very first kiss in the Sims4! Zeus' too! From there things went better relationship wise and Zeus put his money into building a house before he asked the big question. 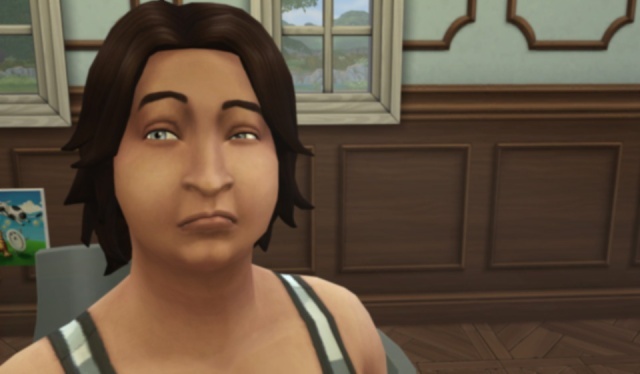 And yeah, Zoe is pregnant. 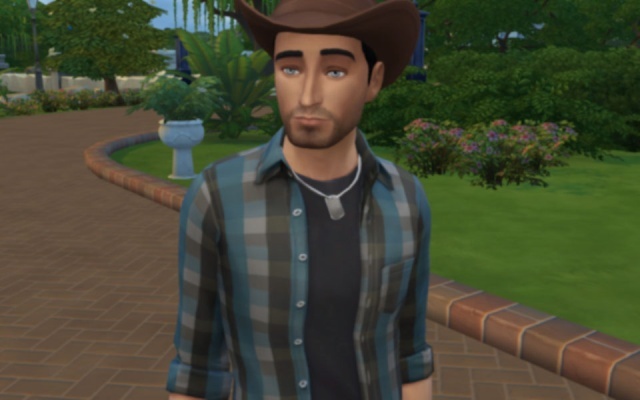 I used this Random Trait Generator for his traits. Here's Zeus looking for usable scrap in a dirt pile. I love how they kneel and are all wrapped up in their work. 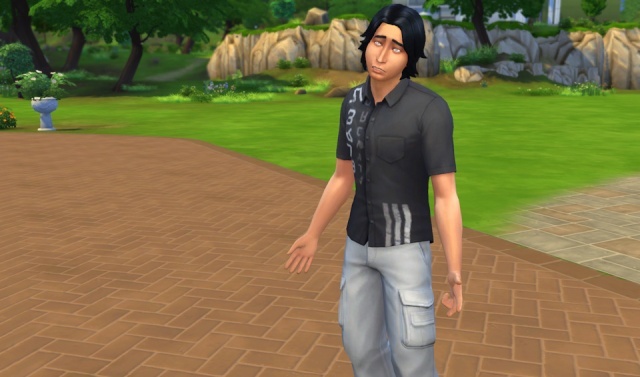 He earned the first of his traits: Perfectionist. 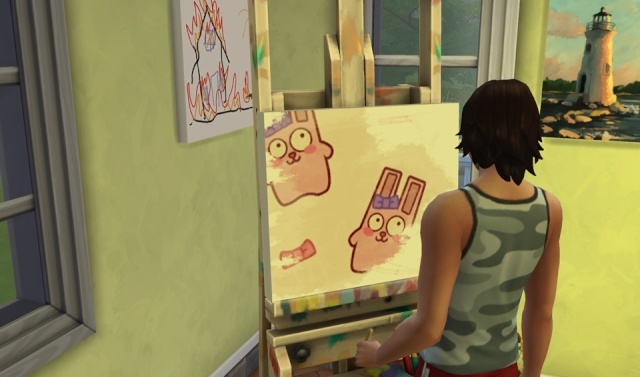 Zeus has reached level 10 of his career (Master of the Real - painter career) and maxed out the painting skill. This is what the house looks like at this point. But she evidently liked it. Wow, great start to the legacy. 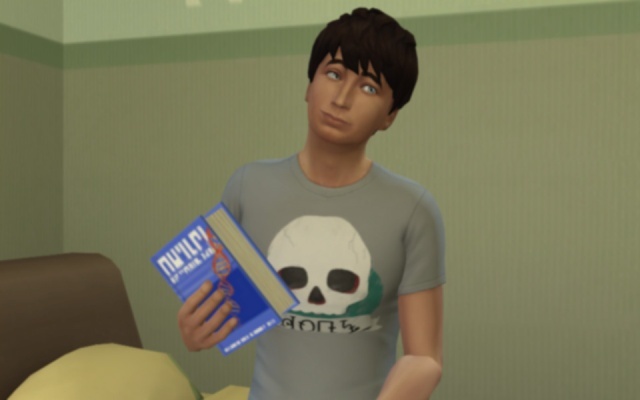 Where is the child aspiration, I haven't seen that on my baby sim? 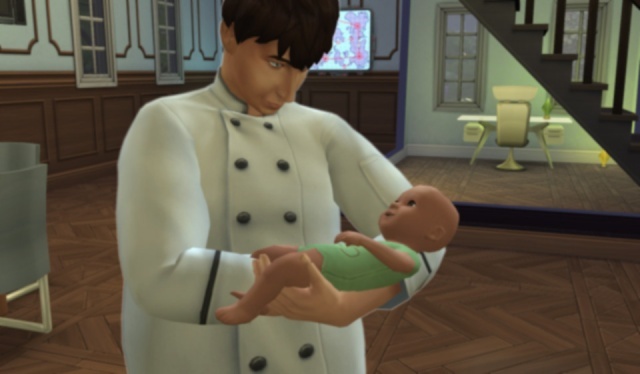 @ Httddy: - The baby sim comes into the world 'clean' with no trait or aspiration. 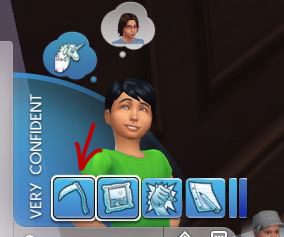 When it grows up to child you are asked to choose a child aspiration and 1 of the three traits. 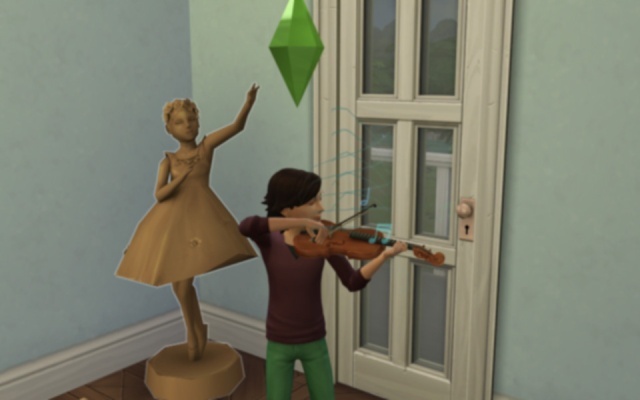 The child aspiration comes without a connected trait. 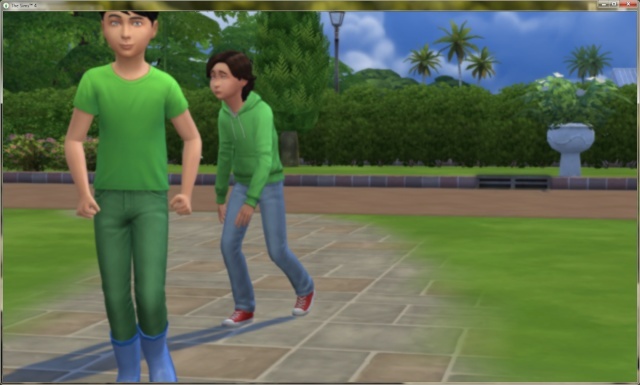 The second and third trait I guess are added as the sim grows up. I haven't pkayed that far yet. 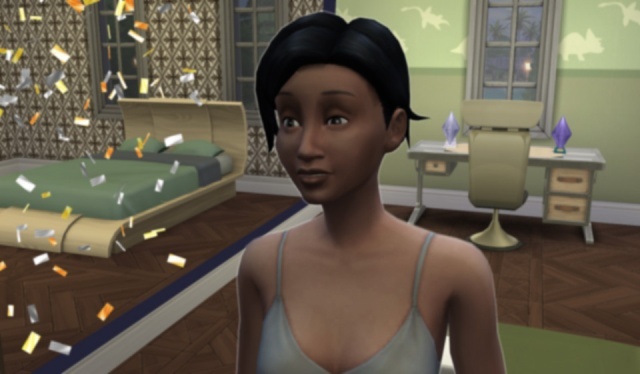 I rolled the traits when Zoe was pregnent just to be prepared, but there's no need to do it that early. You can roll after the child's birth. That is nice in case you get multiples. Sweet story. 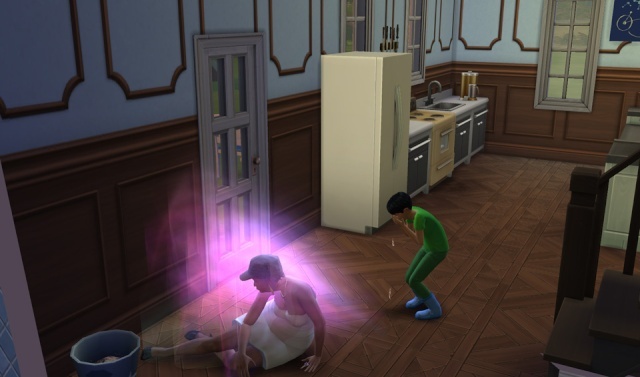 The legacy is off to a great start. Such fun! 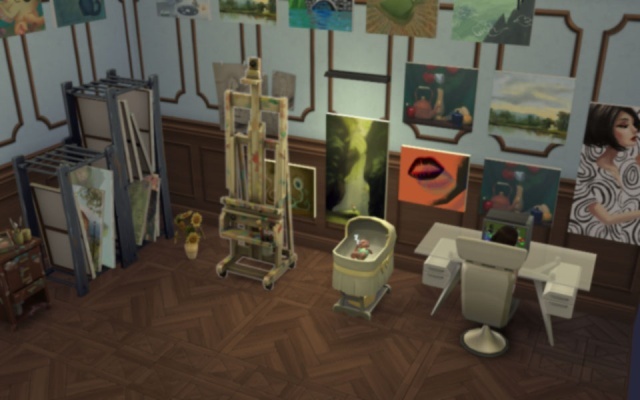 Look at all those paintings! Your doing great! I keep forgetting to check. Do paintings go up in value? Thank you ladies for following. @EQ: I can't see that the paintings go up in value. But most sell with a significant higher price to the art gallery. I haven't found that collectors pay more than the tagged price, maybe they will after the death of an artist. 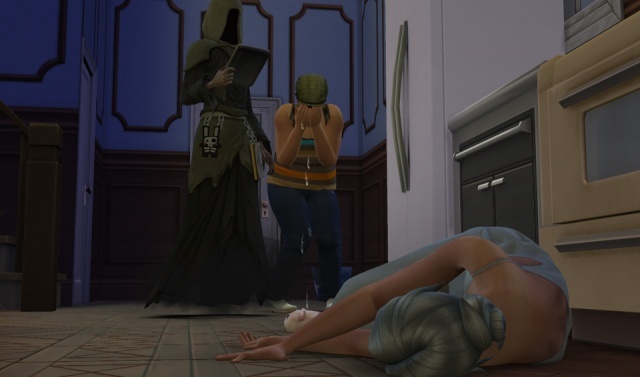 Playing this legacy is quite an adventure. Everything is new and I'm bound to make mistakes. I won't put too much weight on the scoring; makes me feel like working not playing. Let's see how far I'll get, I get distracted a lot with everything that happens in game. 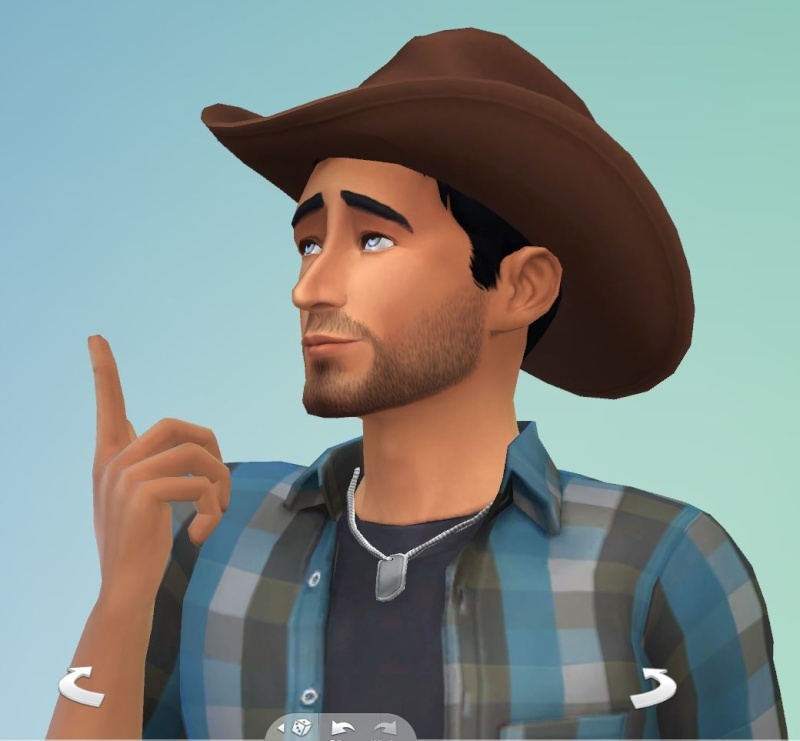 Had to choose his adult aspiration, which according to my former roll is: Angeling Ace associated with the Collector trait. Zoe turned elder before Zeus did. Way into her elder age she is only level 6 of her career (Sectret Agent); and working on the third level of her aspiration (Friend of the World) I can tell she won't make either. 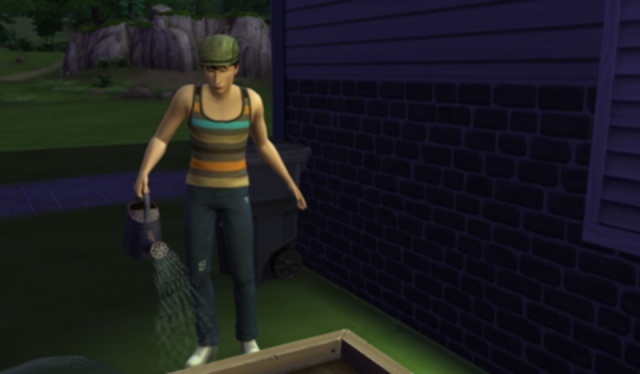 So I sent her out to start on those collections: looking for frogs here. Before her day came I redeemed her aspiration points and got a Potion of Youth (POY). I purchased 5 potions from Zeus aspiration points too and put them all in Zeus' inventory. 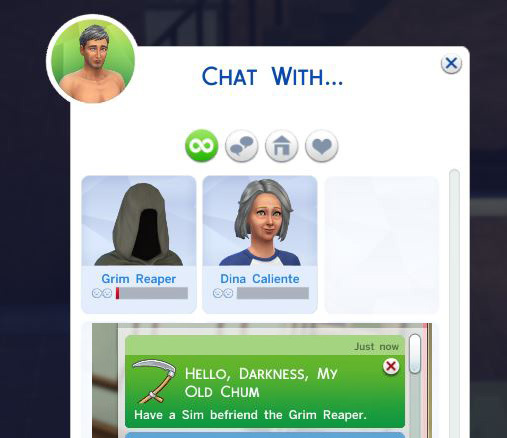 Grim came unexpected. Zeus pleaded with the dark one, but recieved only a cold shoulder. Anyway, Zeus discovered that he could chat with the lethal guy and decided to do so, just for the heck. After a while I got this message (green box). And their relationship was up to friend! Apparently he got inspired. All but throwing the knife! Hermes had his birthday. 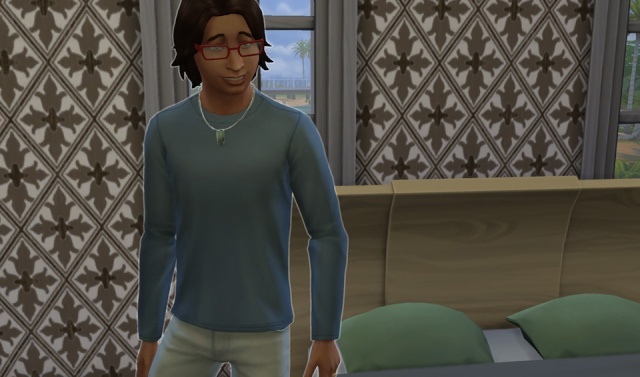 He is now a young adult, which means here starts Generation 2. Frustrating and fun at the same time. 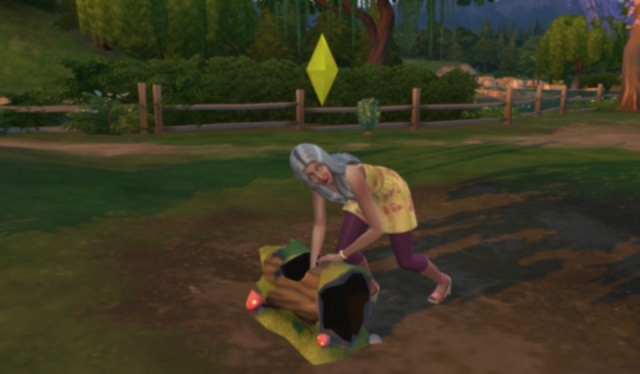 I was hoping some of the childhood traits would give a boost on traits when aging up. It does not seem so though. Thanks for the confirmation on the value of the art pieces. Looking forward to following a long as we all learn how to play this game. Did Zeus have a birthday cake to age to Elder? 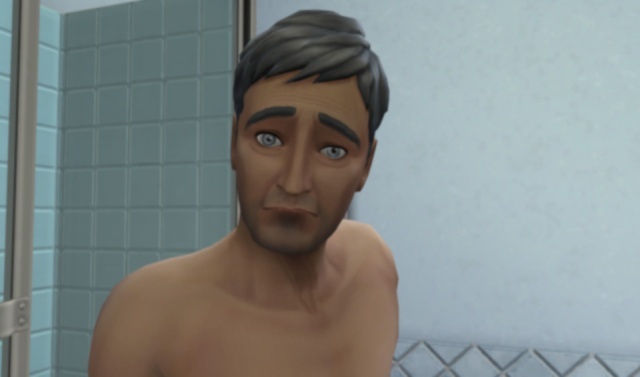 Sims who automatically age up without at least a cake are Sad for days on end. You could wait til the last possible second before aging up. That should avoid conflict with any Legacy rules. I do not keep score either and use the 'rules' as guidelines. No birthday cakes so far. I noticed when clicking on the sad buff it said: sad from forgotten birthday. Cracked me up. 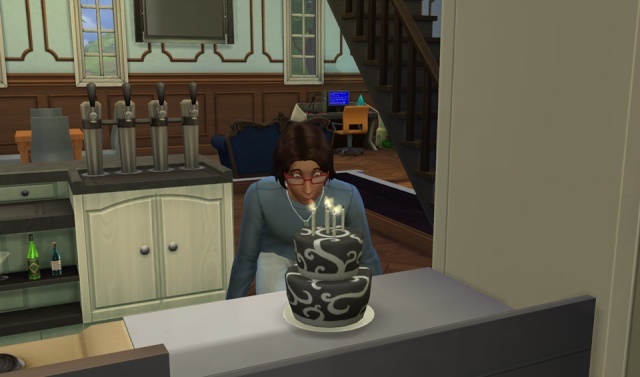 In Sims3 I used the cake only if I wanted to have my sims grow older before time. 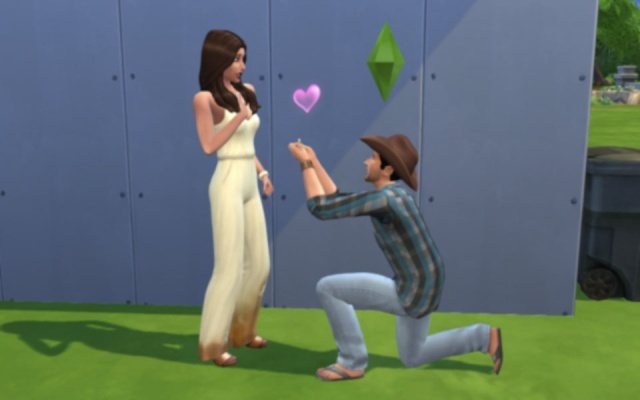 I guess I have to adopt a differnt approach for the sake of my sims. So we start off the second generation with Hermes. 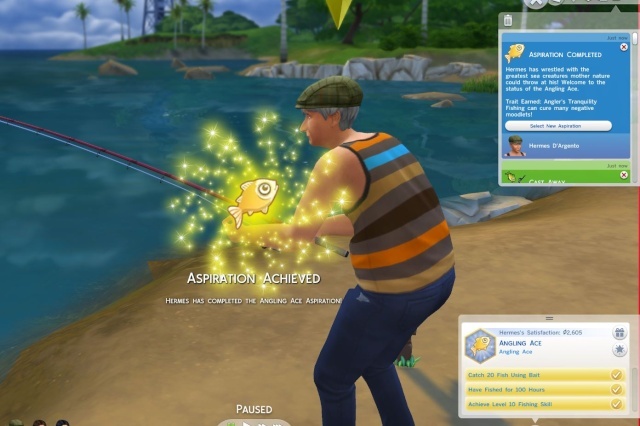 His aspiration is Angeling Ace; off he goes to a fishingspot near their home. Aren't the fireflys pretty? 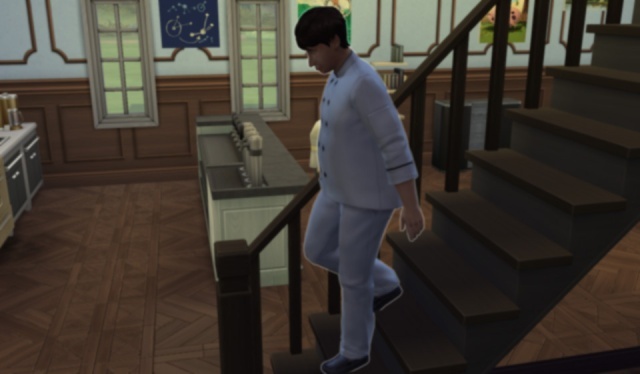 I didn't see anything in the rules that would restrict the choice of career, so I took the culinary for him to proceed. 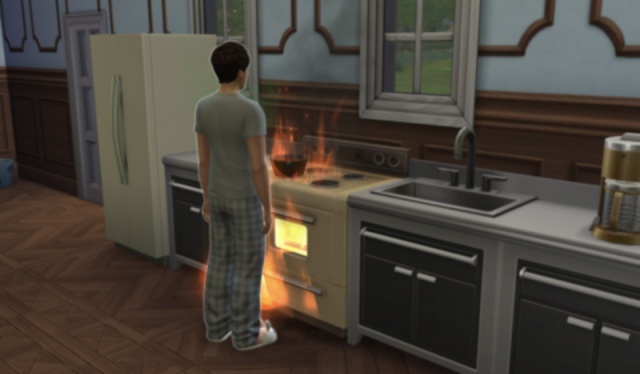 Made him flee to a save spot and have his daddy put out the fire. I noticed, that all his personal inventory went into the family inventory, except the POY! Darn, apparently one has to actually place them on the lot; or they are gone. 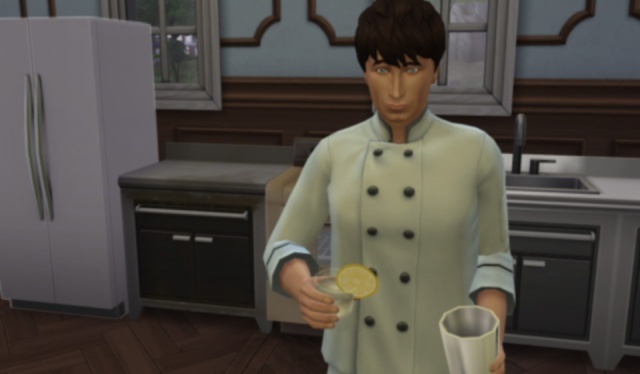 For a job promotion he had to gain several levels of mixology skill. 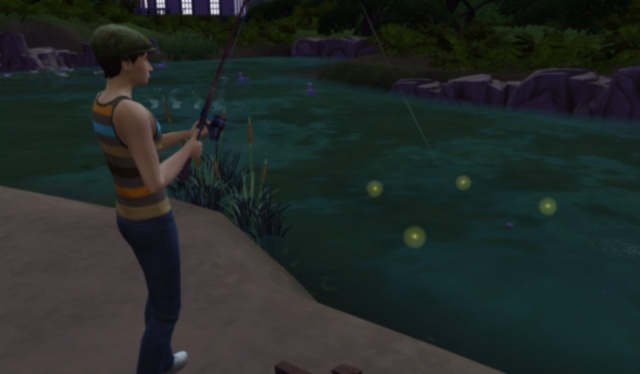 Since he has to go out angling for meeting his aspiration I opted for a home bar. Got the most expensive one. I hope that helps him, although his bills are at §4000 now. 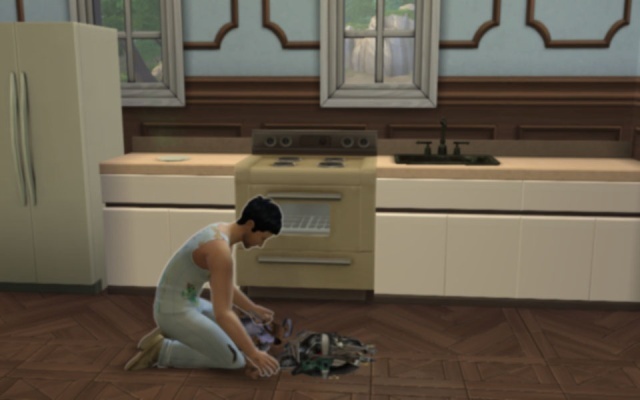 Life for my poor Sim is hard. I was so pleased, when a female actually noticed him amd responded to his flirting. 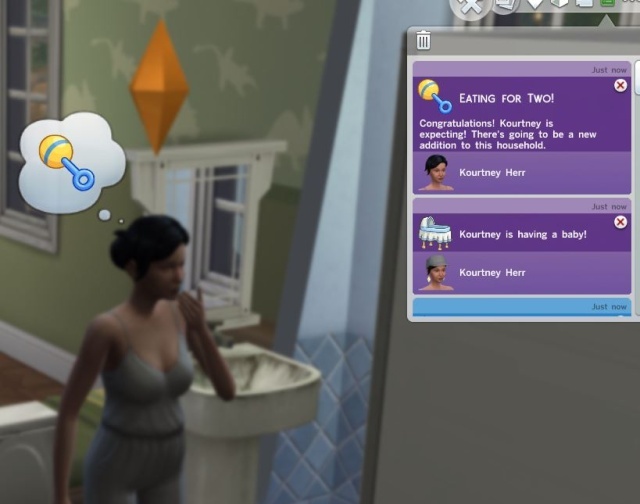 Kourtney gained weight too, but for a very different reason. 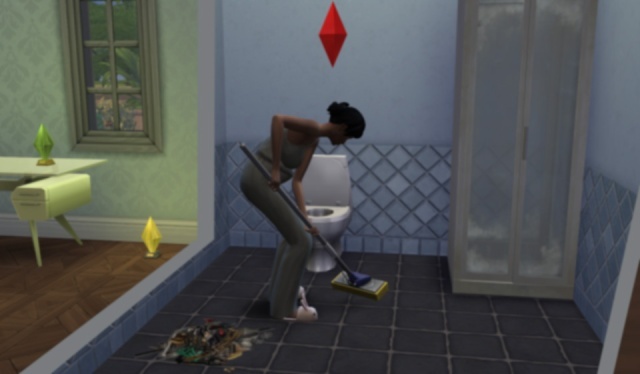 She can't stand the sight and smell of dirt, she took the cleaning of the house upon herself. By the way, I started her in the culinary career too. She is already in her adult age, so I'm pretty sure she won't make the end a career, but she can contribute to the family income. As for her aspiration ... don't see much chance for that either. 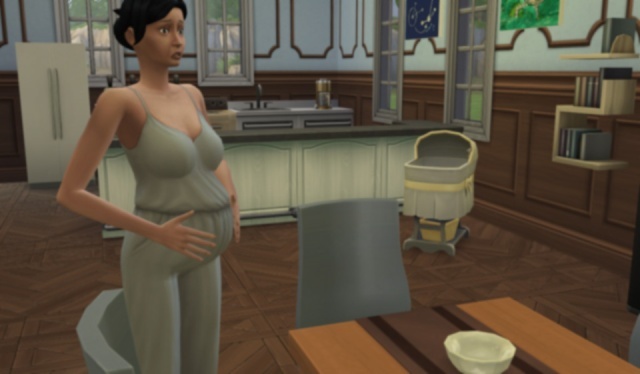 Her pregnancy was long, I think four or five days? and she was in labour for over 24 hours! What a nightmare! (At least she could sleep through a good part of it. 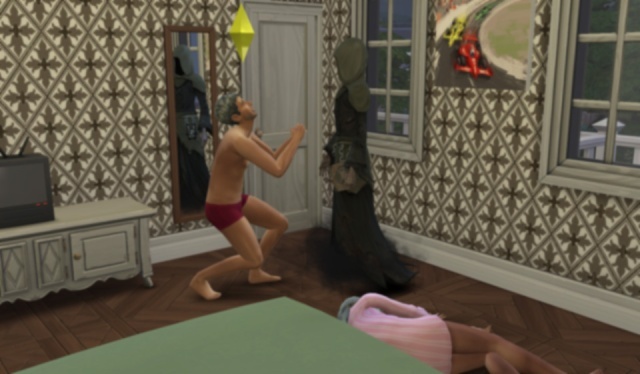 A few days later Hermes and Kourtney celebrated the birth of their son in the privacy of their bedroom. I leave you with Ares and his parents expecting. What will it be; another boy or a girl? Personally I'd like it to be a little girl; but Ares I guess is hoping for a brother ... .
Wow! So much happening The next morning....she was expecting again....poor dear soul! LOL. I always love seeing your post. 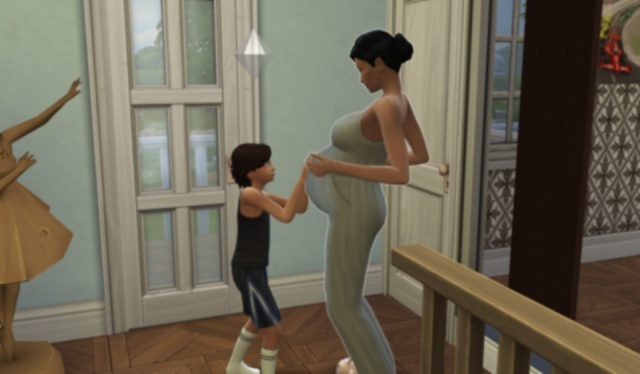 Wow, 5 days for a pregnancy! What percentage of their life is that? 24 hours in labour. Oh my! I finally figured out that the blurry look of my pictures were caused by a super old driver for my grafic card. Hubby moved the insides of my computer to a new shell and somehow the driver update was lost. Lets get to the D'Argento family, much has happend since our last visit. 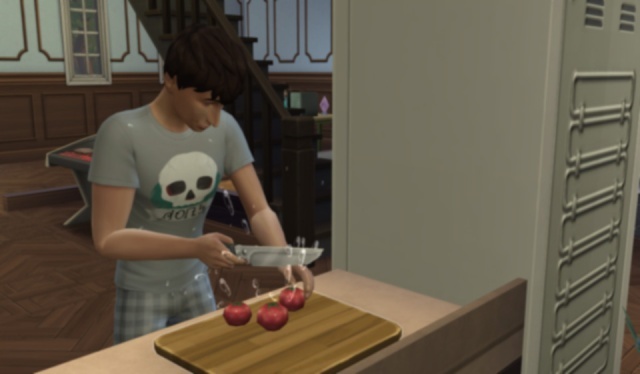 Ares aged up teen, he didn't fulfill his child aspiration; and he shows the effect of his dad's home cooking clearly. I sent him on the treadmill right away. 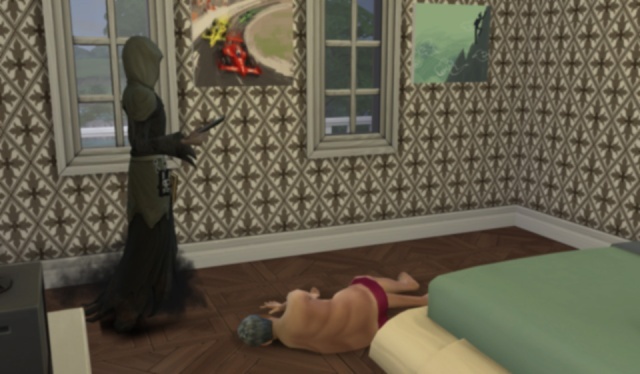 I noticed, that a lot of the sims in the world had died or were elder. Achilles got into a very confident mood from demanding from Grim. Little did he know that the suspension would last only one day. Next evening he successfully pleaded for Kourtney to be spared and had a little chat with the dark one. 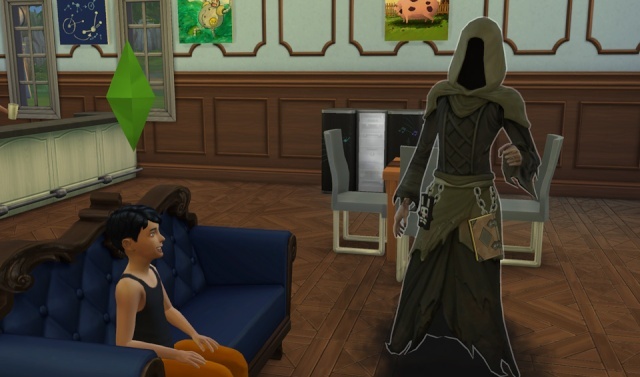 The third day Grim was guest in the house the boy referred from preventing his mother's death. Hermes and Ares had the sad from loosing a loved one mood renewed every time Kourtney was supposed to go. 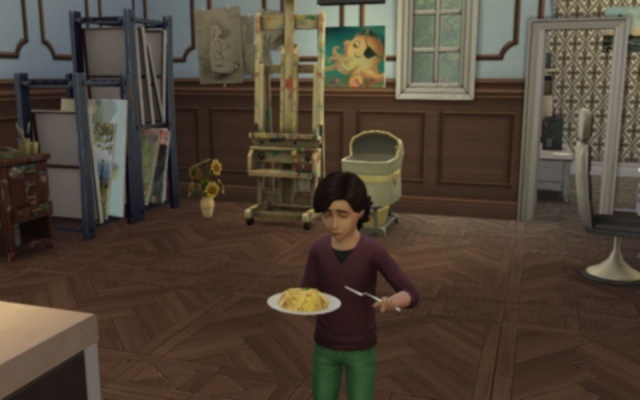 Ares has the Painter Extraordinaire aspiration, he painted through his sadness. Shortly thereafter, Hermes fulfilled his aspiration. Wow! Generation 3 already. Great job.